As he held aloft the flame that never ceases to capture the attention of the world, Mike Fisher was filled with a mix of emotions. But on a frosty Friday night in Gatineau, one thought was so clear and so unmistakable. "I was proud to be Canadian," the Ottawa Senators centre said after doing his part to bring the Olympic Torch Relay into the national capital region. Clad in a white track suit with the words 'Vancouver 2010' emblazoned on the pant legs with a Winter Games toque protecting him from the chill of the wintry winds, Fisher jogged for 300 metres down Boulevard du Carrefour in Gatineau to a round of cheers that also included a few 'Go Sens Go' chants. "Everything they've got going on here, it's pretty neat to be a part of it," Fisher said after running behind the convoy of vehicles that is leading the coast-to-coast torch relay. Just after making the turn onto Boulevard de la Cité, Fisher stopped to light a torch held by Jean Labonté, the captain of Canada's national sledge hockey team. Labonté brought the flame into Place de la Cité and, after making his way through a wildly cheering throng, mounted a stage and lit the Olympic cauldron. Fisher enjoyed his own share of cheers, starting from the moment he climbed into a van that carried the torchbearers to their designated starting points. He was mobbed by fans after his run was done, sharing a keepsake photo with a number of them. The entire experience brought the Olympic spirit a little closer to Fisher, something he clearly felt as he took his turn carrying the torch. "Just that I was proud to be Canadian, and the Olympics and everything that it represents," Fisher said when asked afterward about his thoughts as he ran with the torch. "A lot of different things and emotions. I'm very fortunate to do it and it was neat." There's one moment that might possibly top it — playing for Team Canada at the Vancouver Games. 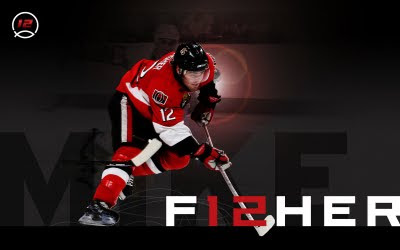 Fisher's hot start with the Senators this season has at least put his name into the conversation for a spot on that team. "That would be even better," Fisher said about the prospect of suiting up for Canada at the 2010 Winter Olympics. "It would be a dream come true if I was able to put the Canadian jersey on (in Vancouver)." The torch relay will spend the weekend in Ottawa-Gatineau, with three other members of the Senators organization taking part in it. Ottawa general manager Bryan Murray will carry the flame from the Alexandra Bridge into Ottawa around 12:10 p.m. on Saturday. Then on Sunday morning, the relay will wind its way down Palladium Drive past Scotiabank Place, with Bill Courchaine, the Sens' director of sales and corporate partnership, carrying the torch at 8:40 a.m.
On Monday at about 7 a.m,, Senators president Cyril Leeder takes the torch down King Edward Avenue in downtown Ottawa, between Laurier Avenue East and Osgoode Street. The 106-day relay, which involves 12,000 torchbearers, will visit more than 1,000 Canadian communities. Traversing in excess of 45,000 kilometres, it is the longest torch relay in Olympic history, culminating in the opening ceremony of the Vancouver Games on Feb. 12. Mike Fisher hopes he doesn’t flame out carrying the Olympic torch through Gatineau Friday night. “I’m going to have do some training this week. I haven’t run that far in a while,” the Senators centre joked about his 300-metre opportunity of a lifetime. GM Bryan Murray gets his chance Saturday; on Monday it will be team president Cyril Leeder. Fisher will become only the second NHLer to carry the Vancouver-bound torch after Sidney Crosby did the honours last month in his hometown of Cole Harbour, N.S. A grateful Fisher didn’t think he’d ever get the chance. “It’s an honour for me and it’s exciting,” said Fisher, who will receive the torch from the Preservation Centre at about 6:50 p.m. and carry it along du Carrefour Blvd. to the intersection of de la Cite Blvd. Murray, who will receive the torch at 12:10 p.m. Saturday as the relay crosses the Alexandra Bridge to St. Patrick St., was surprised to be given the opportunity. 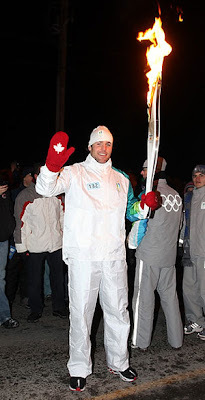 Of course, Fisher wouldn’t mind seeing the Olympic torch again while suiting up for Team Canada in February. His strong play has certainly put him on the radar screen for executive director Steve Yzerman, but Fisher is realistic about his chances. “It’d be a nice surprise if that (playing for Canada) ever happened, but I’m just focused on what I’ve got to do (with the Senators),” said Fisher. “It’s so hard to make the team. You never know really. I’m probably a longshot, but who knows? With 13 goals, Fisher has already equalled his total from last season. He also has 12 assists in 28 games. He is skating better, shooting the puck more and, as always, is diligent in his own end. There was talk Yzerman was in the building last night, but he was actually at home in Detroit flipping through channels on his hockey package. Fisher, who is likely in competition for a spot with Flyers centre Mike Richards, said he isn’t sure if the fact he can play wing will help. I watched it live and it was history being made. I was very proud of Mike that he was chosen for such a great honor. He honored his country and best wishes to him on making Team Canada. Personal Reflections on a variety of subjects of a Fellow Pilgrim on the Journey "Home". Although this pilgrim is a Christian and follower of Jesus, not all posts are on a Christian theme. Much of my life has been spent as a sports chaplain so posts on a sports theme can be found here from time to time. David trusted Jesus Christ as Savior when he was 6 years old. In 1975 God called him to an encouragement ministry to pro athletes through letter-writing, Epistle Sports Ministries. David served with Baseball Chapel as chaplain to the Toronto Blue Jays for 29 seasons. Married to Carol, they have 7 grown children. David's wife Carol founded the Kawartha Komets hockey club for special needs kids and adults. They live in Peterborough, ON. David is an avid reader and book collector. He is a pianist and songwriter and enjoys Southern Gospel music. David also enjoys writing. His favorite preachers are Joseph Stowell & John Piper. Favorites from the past include Alan Redpath, Stephen Olford, D. Martyn Lloyd-Jones & J. Sidlow Baxter. David’s life and ministry have been profoundly influenced by the lives of George Muller & J. Hudson Taylor. David presently works with FRIENDS Peterborough offering help, hope and a "hand up" to those who drop in off the street. Be sure to visit his other blogs listed below. Check out the Kawartha Komets hockey team that we have launched! Click on the logo to be re-directed to the Komets' web site! Amazing Grace "Designs by Beatriz"
Scribbled and posted by the pilgrim, David W. Fisher. Awesome Inc. theme. Theme images by ranplett. Powered by Blogger.